Get a FREE guide including the best cloud software stocks to buy now! You should always be fine-tuning your list of stocks to buy. Part of the process should be to consider the big picture trends that will help your choices lead the market higher. I have one suggestion: consider cloud software stocks that are benefiting from low unemployment in the U.S.
It’s true. These stocks have a chance to become the next Apple, Amazon, or Google. Its proprietary diagnostics tool could soon be adopted by one of its big pharmaceutical partners as a tool accompanying one of their drugs – and their names are revealed in our FREE Special report, How to Find Small-Cap Stocks; Plus the Three Best Specialty Cloud Software Stocks to Buy Now. You read that right. Cabot’s small-cap investing guru has discovered 3 stocks poised for astonishing success … and we’re giving you the names for free. Download our FREE Special Report to learn the names of these promising companies and find out why we’re so certain about them – right now! Why are we giving away this guide for free? At Cabot, we’re not just an investing advisory publisher, we’re a family of investors (including the second and third generations of our founder’s family), and we want everyone to succeed in the market like we do. We can certainly afford to give away some of our secrets to investors like you who have the ambition to learn new wealth-building strategies – such as small-cap investing. Why should you invest in the best small-cap stocks? Profit from the hidden stock gems. Many investors have no idea how profitable these stocks can be. And many more have no idea how to find the best ones, because they operate without the media coverage that bigger company stocks enjoy. Which, of course, is exactly why they’re such good investments: Without the media driving buyers, prices for small-cap stocks remain temptingly low until they hit the big time, by which time savvy early investors are reaping the profits. Of course, there is a potential downside to investing in the best small-cap stocks and it’s explained to you in detail in this guide, along with the best strategy to minimize risk of losses. And after you read this FREE guide, you’ll become one of those very smart, very wealthy investors who can identify the best small-cap stocks and protect your portfolio. Download it now! The reason many investors fail to profit from small-cap stocks is they’re tricky to identify, and the criteria you should use in your research is different from the criteria used to find larger stocks. But you can and should become adept in this investing field, and make other investors’ losses your gain! It all starts when you read this guide. You’ll get our expert’s rules for successful small-cap investing, all of them common-sense guidelines, explained in detail without jargon or complicated formulas. For example, it might surprise you to learn that even though low stock prices might seem like bargains, the price of a stock is fairly unimportant in choosing a company to invest in. As you’ll learn in the guide, you must measure the company, not the stock price. What else will you learn about identifying the best small-cap stocks? Find out how our expert begins his search and learn the criteria to identify what he calls a “pure play.” Understanding this strategy would have allowed you to get in on mighty Cisco before the big players did – that is, before its stock increased 70-fold. How valuable to you as an investor is a strategy like that? 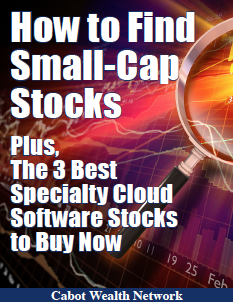 Learn how in this FREE Special Report, How to Find Small-Cap Stocks; Plus the Three Best Cloud Software Stocks to Buy Now. Of course, this guide doesn’t just teach you how to find the best small-cap stocks. It gives you a jump-start on this kind of investing by delivering our expert’s favorites. Now, you may be wondering why you should trust us here at Cabot Wealth Network. Let me just say Cabot is unlike any other investing advisor you’ve ever used. We’re not just advisors, we’re personal contacts for our subscribers’ guidance and support, which means our hard-won reputation is expressed in the expertise we’re sharing in this guide. As I mentioned above, we’re a family – a family of both advisors and investors, many of whom are themselves second generation subscribers. There are no get-rich-quick folks here at Cabot: you can trust the information and guidance in this guide because we stake our reputations on it! This is also one of the most straightforward, user-friendly investing guides you’ll ever read. We don’t do jargon, we don’t talk down to our readers and we don’t write for insiders – we write for normal human beings! And this particular guide has been written by Tyler Laundon, Chief Analyst of Cabot Small-Cap Confidential. Tyler has spent his entire career managing, consulting for and analyzing start-up and small-cap companies, including founding and operating his own small business for 15 years. How to Find Small-Cap Stocks; Plus the Three Best Cloud Software Stocks to Buy Now. Since 2012, Mr. Laundon has led his loyal readers into 10 doubles. Between 2012 and September 2015, his small-cap recommendations generated cumulative returns of over 2,300%, including both winners and losers, and outperformed the Russell 2000 Index by an average of 28% per year. All in all, I think you can see why so many investors have already downloaded this free guide. It’s timely, it’s expert and it’s the perfect way to learn the ins and outs of small-cap investing, and to start diversifying your portfolio with these hidden gems. I urge you to download this Special Report right now. Less than half an hour of reading will make an enormous difference in your investing approach – and the wealth you want to build. PPS: Author Tyler Laundon tells you in this guide that by using his 10 specific steps for choosing profitable small-cap stocks, he always finds stocks with 100% or greater upside within a two-year time frame. If that sounds good to you, read the guide now!